If you've been following along with my blog, you'll know that this Winter I've had a bit of a handmade snowman obsession. From tube sock snowmen to an army of crocheted snowmen, I have been experimenting with several crafty ways to create the little guys, and will probably experiment with even more ways to create fun snowmen throughout the season. After being unsatisfied with the thought of using a button for a nose or drawing on a nose or skipping the nose all-together, I decided to dig out a few packages of polymer clay from years ago (thankfully they weren't dried out!). I then sculpted some tiny carrot noses and some button eyes. The noses were my favorite, and I have been using them on all my handmade snowmen. 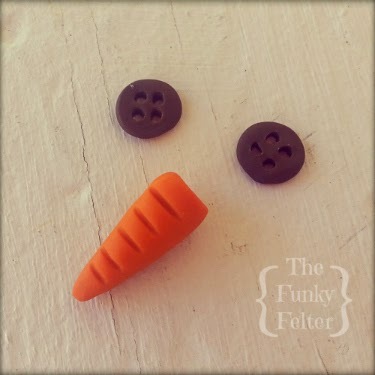 The dark brown button eyes weren't my favorite, but I've used them on a couple of snowmen and used a variety of commercially made buttons for the rest. Wiggle eyes would also be an option, but I haven't tried that yet on the ones I've made so far. The polyclay tutorial below is very easy to do! And inexpensive as well! I have been crafting for years (and years and years) and was quite surprised myself how easy these were to make in batches. If you are creating handmade snowmen gifts for family and friends or perhaps whipping up several for craft shows, these polymer clay carrot noses and button eyes are a very good way to go - simple, fast and cheap, but they look great too. Prep: Line your non-food pan with aluminum foil (shiney side down seems to work better for me). Preheat your oven according to the polymer clay package directions. 1. For the carrot noses, first work the orange clay with your hands until it is pliable. Roll a small lump of it back and forth in your hands forming a quarter inch size cylinder shape about 6 to 8 inches long. Lay the cylinder stretched out on a small sheet of aluminum foil. Then use a flat surface, like a butter knife, to cut it into inch long or so pieces (exact measured lengths are really not that important on this craft). Pick up each piece one at a time. Roll one end into a point and scrunch the other end down a bit forming a long cone, or carrot, shape. Then use the paper clip or toothpick to make a few little notches on one side like the crooks and stripes on a carrot. Repeat for each carrot piece laying them on the non-food pan to bake later when formed. 2. For the button eyes, follow the same procedure to roll a cylinder with the dark brown clay and lay it on the aluminum foil. This time though, use the flat knife to cut much thinner sections of clay about a quarter inch wide each. Flatten or squish each little disk you just made into a pancake shaped circle. Then use the paper clip or toothpick to make four holes in each button (or two holes if you prefer). First form the holes on one side, then carefully flip each button using the flat knife and trace the holes again on the other side so they are evenly formed. Lay each on the non-food pan for baking later. 3. For baking, follow the manufacturer's instructions for baking your polymer clay. Depending on what brand you purchased, baking times and temperatures can vary a little. 4. When finished baking, let sit for about a half hour or so to completely cool down before putting them on your handmade snowmen. Then use hot glue or thick tacky glue to adhere a carrot nose on each snowman. Sew on the button eyes or glue them down as you like. Did you find this useful? I have a lot more craft tutorials on the horizon. Be sure to follow me or subscribe to my feed through the subscription box on the side to get those upcoming posts. Don't miss out! Yay! Now I can finally make the melted snowman ornaments I've been dreaming up! I saw Lego carrot which was the perfect size and kept wondering how I was going to find a handful of Lego carrots which would be pricey. Now I don't need them! Thank you!